Since I've become cake obsessed on this blog lately, I though it's about time for a change! How about some cookies instead haha? But not just normal cookies, oh no, Bens cookies have been my favorite ever since I first had one. They aren't normal chocolate chip cookies, they are chocolate CHUNK cookies. They are huge and gooey and yummy and usually when I get one from the shop, they have just come out of the oven are are still warm and melty mmmmm. I spotted one of their stores outside work a few weeks ago that I never realised was there before! Of course, I had to pop in for a little treat, I got a bit carried away and came out with a whole bag to take home haha but when I saw the prices for a big box, it totally made sense. They usually price them on weight so one cookie is between £1.30 and £1.70ish or you could just buy a box of 15 for £15 - totally worth it. 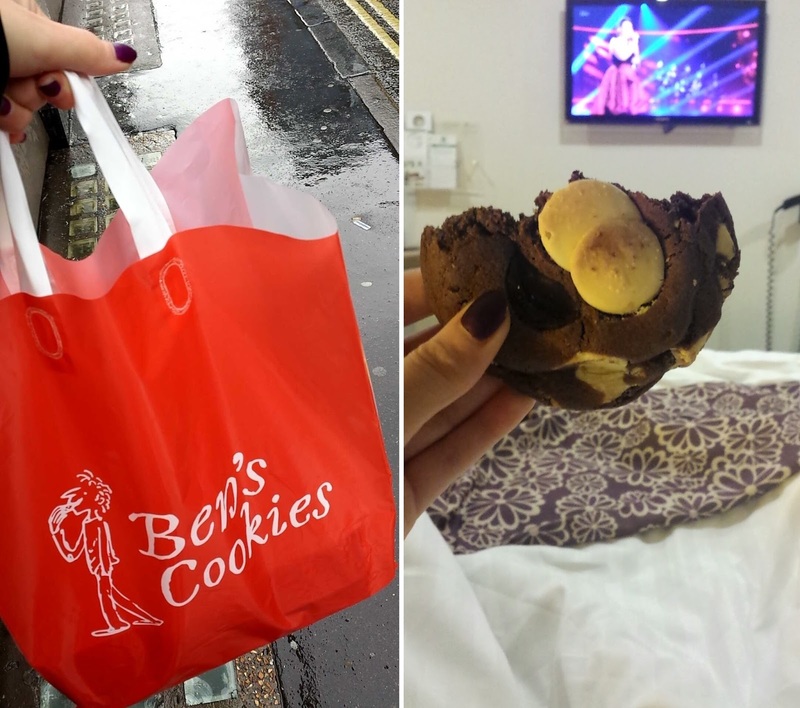 Mmm, I love Ben's cookies, I am a regular at the one in Bristol and the one in Bath! Ben and I love the coconut ones, and their ginger chunk one is just amazing...aah, I really want one right now! These look delicious! I wish they had a store where I live. I have heard a lot about these cookies. Hopefully, the next time I find myself in London, I can remember this place. I used to work around the corner from this particular store and my colleague and I were constantly in there! Such gorgeous, warm gooey cookies! Can't beat 'em!